I’d heard rumours on the grapevine of a hard new addition in Coire an t-Sneachda by Pete MacPherson and Martin Moran on Saturday (November 13), so I was delighted when Pete contacted me last night with details of their ascent. Omerta climbs the thin crack-line on the left wall of Belhaven on Fiacaill Buttress. Martin led the awkward entry pitch (tech 7) and then Pete led the thin crack through the steep blank wall above. This was very sustained (tech 9) and difficult to protect and unfortunately Pete had to take a rest just one move below easy ground at the top of the pitch. Martin then led the final steep crack up the final wall (another tech 8 pitch), which fortunately was better protected. 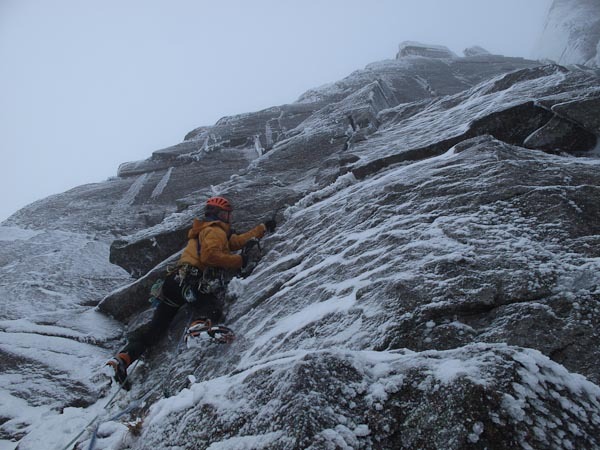 This entry was posted in New Routes and tagged Martin Moran, Northern Corries, Pete MacPherson. Bookmark the permalink.